Every starter kit from Euro Vape includes one CE5 clearomizer. The clearomizer is an all-in-one unit that stores your e-liquid and houses the atomizer coil that creates vapour. It’s a key part of your vaping setup, so treating it right is important. Are you considering vaping for the first time – or are you looking for tips about how to get the most out of your Euro Vape eGo e-cigarette? This article is for you. We’re going to learn how to fill, clean and maintain a CE5 clearomizer. When you look at the CE5 clearomizer from the side, you’ll see two long wicks that draw e-liquid from the bottom of the reservoir to the heating coil at the top of the clearomizer. When you press the button on your Euro Vape e-cigarette, you draw air in through vents at the bottom of the clearomizer. The air travels through a centre air tube and carries the vapour from the heating coil to your mouth. As you vape, the wicks keep the heating coil wet until the tank is empty. The CE5 clearomizer is a simple, reliable design that’s been keeping e-cigarette users satisfied for many years. To fill the CE5 clearomizer, gently twist off the black mouthpiece. This exposes the reservoir and the centre air tube. Place the nozzle of your e-liquid bottle near the edge of the clearomizer and fill the reservoir slowly, ensuring that no e-liquid enters the air tube. Stop filling and replace the black mouthpiece when the level of e-liquid reaches the top fill line on the side of the clearomizer. When you fill a new clearomizer for the first time, you need to wait a few minutes before vaping. Waiting gives the wick time to draw e-liquid from the reservoir to the coil. You’ll experience a harsh, unpleasant “dry hit” if you vape before the heating coil is sufficiently wet. The way to get the most possible vapour production from the CE5 clearomizer is by holding the button on your Euro Vape eGo vape pen and taking long, slow puffs. Don’t take short, firm puffs as you might with a real cigarette. Fast puffs will draw e-liquid from the clearomizer’s reservoir into the centre air tube. If that happens, you’ll hear a gurgling noise when you vape and will experience diminished vapour production. To avoid dry hits and prolong the life of your heating coil, you should never allow your CE5 clearomizer to become completely empty. Add e-liquid to the tank promptly when you notice that the level is low. Fill the reservoir before it is completely empty to avoid dry hits. Firing the coil when dry could ruin the clearomizer. Wait several seconds between each puff to give the wick a chance to re-saturate. You should only use the clearomizer with a wet heating coil. Avoid very sweet e-liquids. Over time, they can ruin the heating coil in your clearomizer. We’ll explain why shortly. Since the life of a clearomizer is relatively brief, it’s usually not necessary to clean one. You may decide that you want to clean a clearomizer anyway, though – perhaps because you want to wash out all traces of a previous e-liquid before filling your cartomizer with a different vape juice. You can clean your clearomizer by disassembling it and swishing it in warm water. You can clean away stubborn residue by swishing your clearomizer in vodka instead. Allow the clearomizer to dry thoroughly before filling and using it again. If you don’t have another clearomizer that you can use while the first one dries, you can speed the process along a bit with a hair dryer on the lowest heat setting. Plastic can melt under high heat, so be careful and use a hair dryer only if you must. After extended use, condensation may form in the centre air tube of your clearomizer. You’ll know that the air tube is clogged because you’ll hear a gurgling noise when you vape. The air tube can also become clogged if you puff too firmly on the clearomizer or make a mistake when filling it. You can clear a clog quickly with some air pressure and a paper towel. This process will waste some of the e-liquid in the clearomizer, so do it only when the clearomizer is empty. Remove the clearomizer from your e-cigarette and place a paper towel over the bottom cap. Blow firmly to make the condensed e-liquid exit the clearomizer through the bottom air holes. By clearing out the air tube, you can stop the gurgling and restore the clearomizer’s original performance. How Long do CE5 Clearomizers Last? Should I Avoid Certain E-Liquids? You can generally expect a new CE5 clearomizer to provide about 1-2 weeks of regular vaping, but your usage pattern can greatly affect the clearomizer’s life. The best thing that you can do to prolong the life of a clearomizer is to avoid sweetened e-liquids. Sweeteners leave residue on atomizer coils. Eventually, the layer of residue becomes so thick that it burns when you try to vape. Vapers call that residue “coil gunk,” and it ruins the flavour of every e-liquid. If you use sweetened e-liquids, don’t expect your clearomizers to last long. The second type of e-liquid that you should avoid in a clearomizer is “Max VG” or “High VG” e-liquid. Along with flavours and nicotine, e-liquid contains two primary components: propylene glycol and vegetable glycerine. 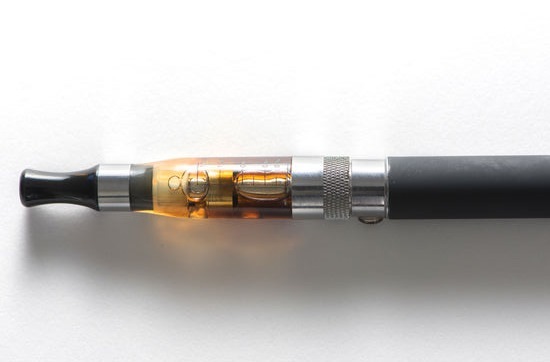 Propylene glycol is thin and passes easily through the small wick holes in a CE5 clearomizer. Vegetable glycerine, on the other hand, is much thicker and can clog small wick holes. Most standard e-liquids work fine in clearomizers, but “High VG” and “Max VG” e-liquids will lead to dry hits.